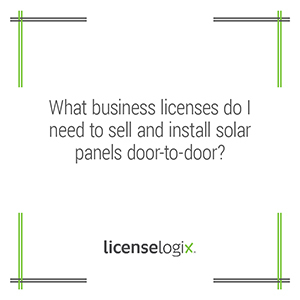 What business licenses do I need to sell and install solar panels door-to-door? As with all business activities, you need to make sure you are in compliance with all levels of government before you begin doing business in a jurisdiction. For solar panel sales and installation this includes state, county, and local government regulations. On the state level, you may need to register the business with the Secretary of State, register for sales tax, and register for payroll taxes if you will be hiring residents of that state. The state may also require an itinerant merchant or peddler license for companies who solicit door to door and do not have a permanent location within the state. Depending on the type of solar panels and the scope of work, you may need a state contractor license. Many states have specific licenses for solar contracting and residential/home improvement contractors, both of which may be applicable, while other states require solar installers to be licensed as electrical contractors. A solar contractor is generally defined as a contractor who installs, modifies, maintains, and repairs thermal and photovoltaic solar energy systems. These licenses are generally overseen by a state Contractors Board that administers examinations, evaluates experience and issues licenses. The next step is to determine what type of local licenses you will need. If the city or county has a basic business license required for any company transacting business in that jurisdiction, you may need that. In most jurisdictions you will need some type of license or registration in order to solicit door to door. These licenses can be called a peddler license, a solicitor license, or a vendor license. Sometimes, you will need to register with the local police department to alert them that you will be soliciting door to door. Solicitation applications frequently require copies of each employee’s driver’s license, proof of employment, vehicle registration, and dates/hours of solicitation. Some applications require fingerprints and background checks. In rare cases, door to door solicitation may be banned by a town or municipality. Many counties, towns, and cities require additional licensure and registration for contractors performing work in their jurisdiction. In some states such as New York and New Jersey, contractors are regulated on the local level rather then statewide. Make sure you have investigated these requirements as well before you begin installing solar panels on residential or commercial buildings in a jurisdiction. LicenseLogix can help companies determine the licenses required for a solar contractors embarking on a statewide solicitation campaign. Our services will help your company obtain all licenses and registrations and manage ongoing license renewals and compliance with state and local laws and regulations. For additional help you can fill in the form on the bottom or give us a call at (800) 292-0909.